Do you know the way to San Jose? 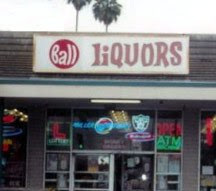 Next time you're there, be sure to stop in at Ball Liquors. Come for the pun, stay for the wacky lettering on their sign. Just like the Dew Drop Inn. Liquor in the front. Poker in the rear.